So we planned to meet at the intersection of two rural roads. Seemingly nowhere but this a ground zero. 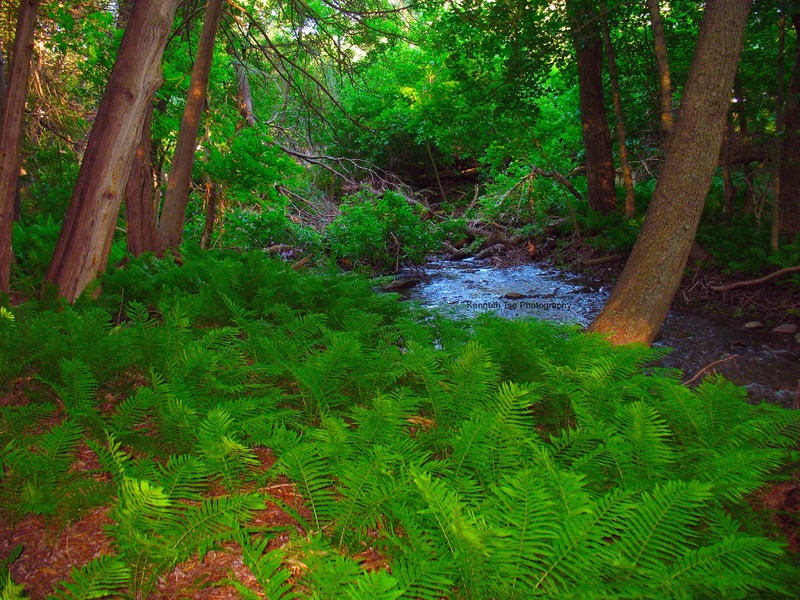 Right by a little convenient pullout spot, there lies a shallow weedy pond next to a culvert of a small stream. I arrived before Michael and started putting my micro gear together - a 10' telescopic tenkara rod, 6lb fluorocarbon leader and 2lb fly tippet. To the tippet, an Owner "New Half Moon" tanago hook was painstakingly attached with a uni knot. The tiniest pinch of nightcralwer was (best described) wrapped to the microscopic hook point, perhaps somewhere, somehow it would be secured on the hook. Immediately, I saw some small fish flirting about. Some were in pairs, some were in small schools and then there were the odd loners. I tried for the tiny schools first, perhaps the presence of fellow schoolmates would induce some kind of competition for food. I was proven wrong and the fish in schools largely ignored the bait. Then I noticed one lone fish that seemed to be picking algae off a rock. I dropped the rig toward it and the fish responded by biting the splitshot. Seeing interest, I lifted the baited hook to the level and the fish immediately took the bait. It was just that easy. 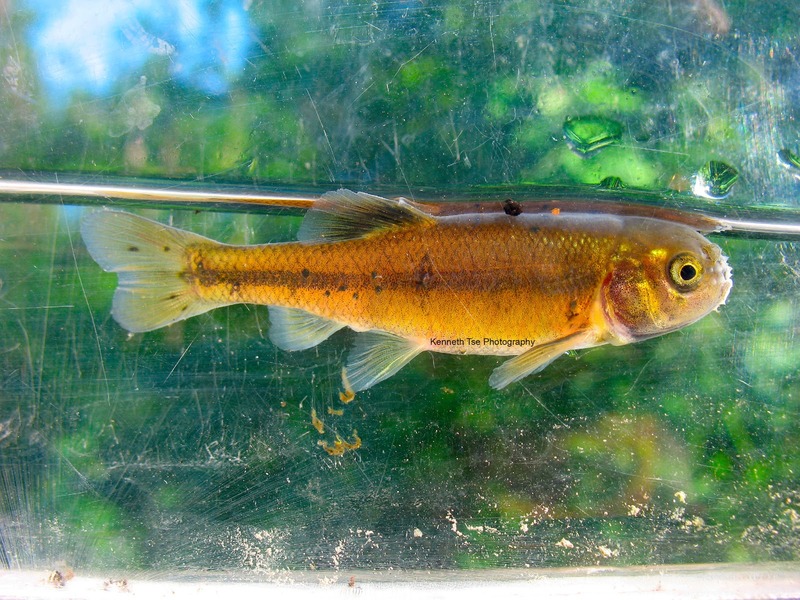 A spawning male Fathead Minnow with tubercles on his head. He also has a dark vertical patch bordering the gill plate. Fathead Minnow (Pimephales promelas) - Species #326...which would also make it official my 1% fish. As I was taking pictures, Michael arrived. 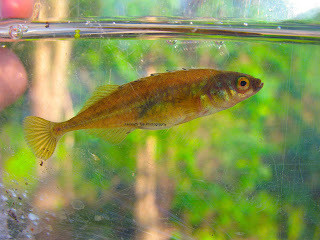 When the fish was finally released from the photo shoot, Michael and I moved down to the culvert for the next target. This little creek was very shallow with sparse vegetation. Many little fish were hovering about. We saw one male guarding a nest. Since it was the biggest fish around, I tried to target it for awhile...but the male was too busy chasing other around and once in a while retreating into its tunnel nest. So I tried to fish another gathering of these little fish. With more mouths around, the competition for food was fierce. I could often feel the bites and tug on the light rod, but setting the hook on these tiny mouths proved difficult. Finally, one made a mistake to take the bait just a little bit deeper in the mouth and it was mine! Michael and I would toy around with a few more and I would catch two more stickleback before moving on. So far, my trip was having a really great CPF. Cost Per Fish (species) is one of many metrics I like to use to judge the success of a particular species hunting trip. On average, each species cost about $40. On some successful travels, my CPF was as high as $20 per species. Some of my rather troublesome local species, such as Longnose Gar or Mooneye, has CPF as high as $150-200. To that point, I would have only spent $5 in gas to catch two new species. Even accounting for the return trip home $10 total), today's CFP was still one of the most efficient. However, Michael suggested checking out two other locations in the area for more new species. Unfortunately, the story ends here. We checked out two other streams but no new species were found. This particular stream was very beautiful but we did not see a single fish. Weird. I think this stream warrants a return survey in the summer when the water is lower, clearer and slower. Not bad for after work species hunting. Of course I have to thank my protege for sharing some "sensitive information" with me. Congrats on reaching the 1% milestone! It baffles me why I've never come across a fathead minnow. Any tips?